It was windy, again, here on Little River near Hertford, NC. Wind makes shooting a challenge and cycling tough. There is no escaping the wind. Still, archery practice and triathlon training go on. First on my agenda for today was a bike ride. I’d have a tailwind heading out and a headwind on the return. 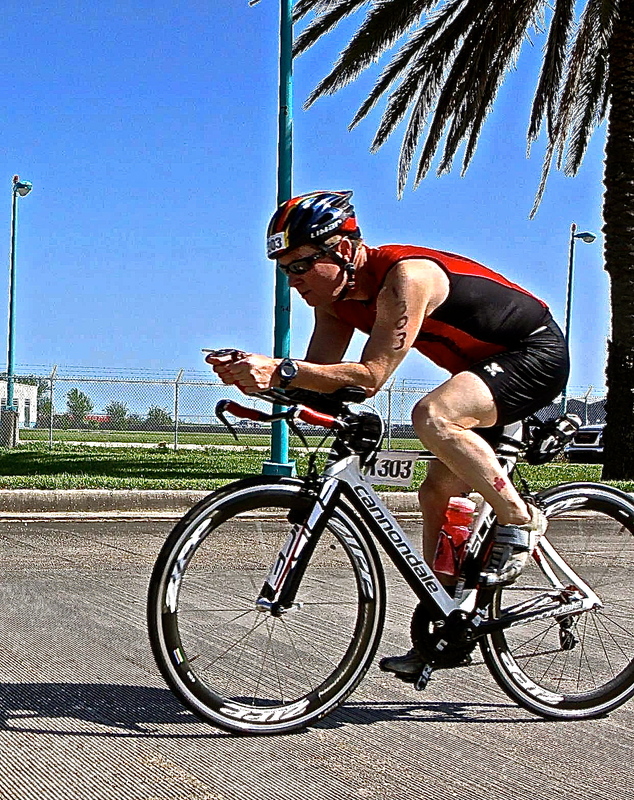 To make the most of the ride I selected a Cervélo P2SL designed to cut the wind. I’d enjoy the tailwind and slide through, as best as possible, the headwind. 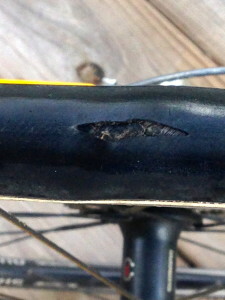 I always check my tires before I ride and found a cut in the rear tire. The Cervélo was down and out. 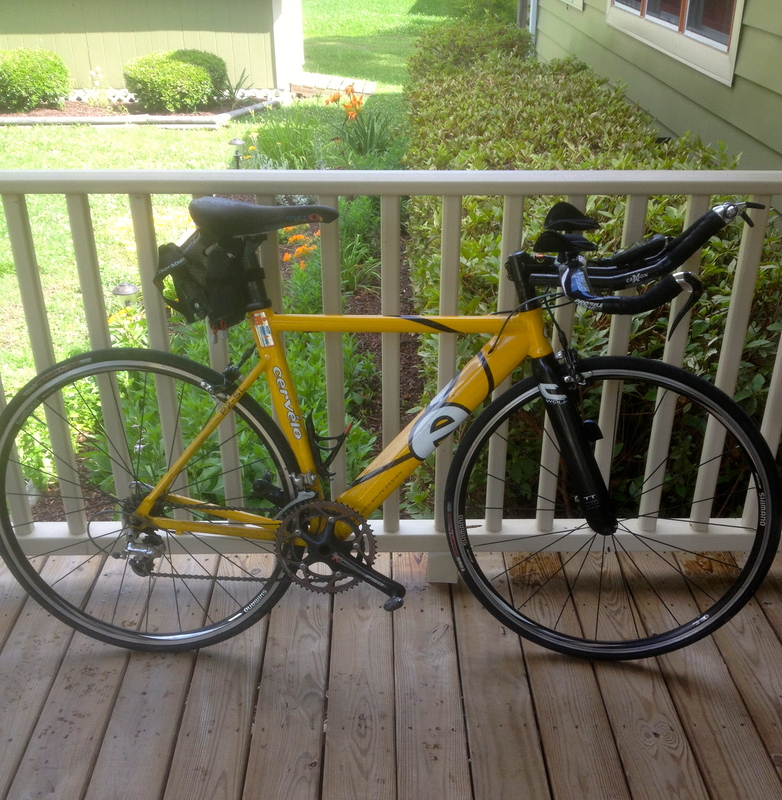 I’d make due on a road bike, my Litespeed. The ride was great, as I imagined it would be, heading out. The headwind on the return was about as bad as any Trade Wind hitting the Queen Ka’ahumanu between Kona and Hawi. 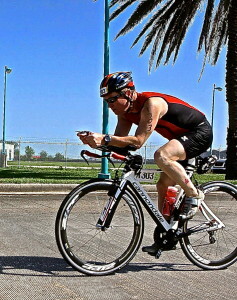 I found some pleasure reflecting back on those winds during an Ironman on the Big Island of Hawaii. Shooting my bow was another matter. The wind blew my arms and body so that my sway control needed a lot of attention. 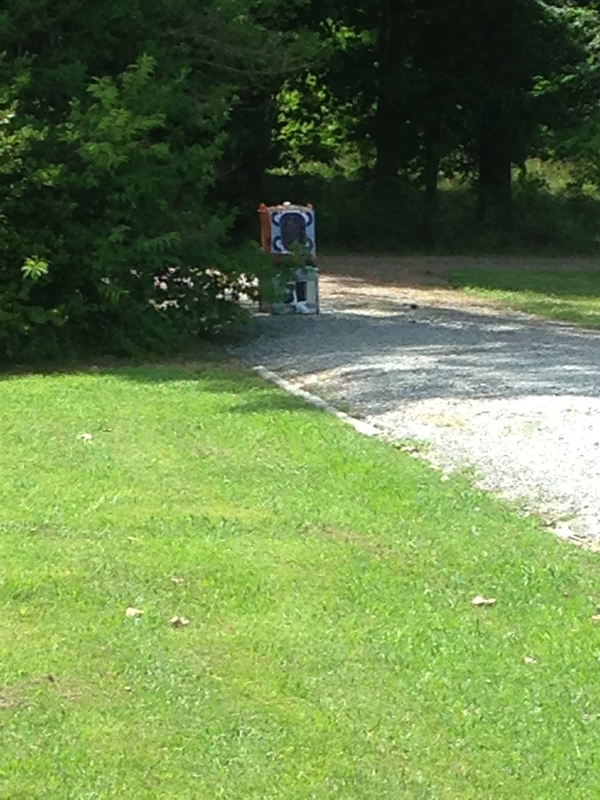 Aiming for a smallish bag with a rifle paper target from 35 yards in such wind was difficult. One of my coaches, in cycling, would make us train regardless of the conditions. He reminded us that we can’t control the weather on race day and needed the experience riding in heavy wind or rain. A number of times, his coaching and our foul weather training proved to be in our favor. 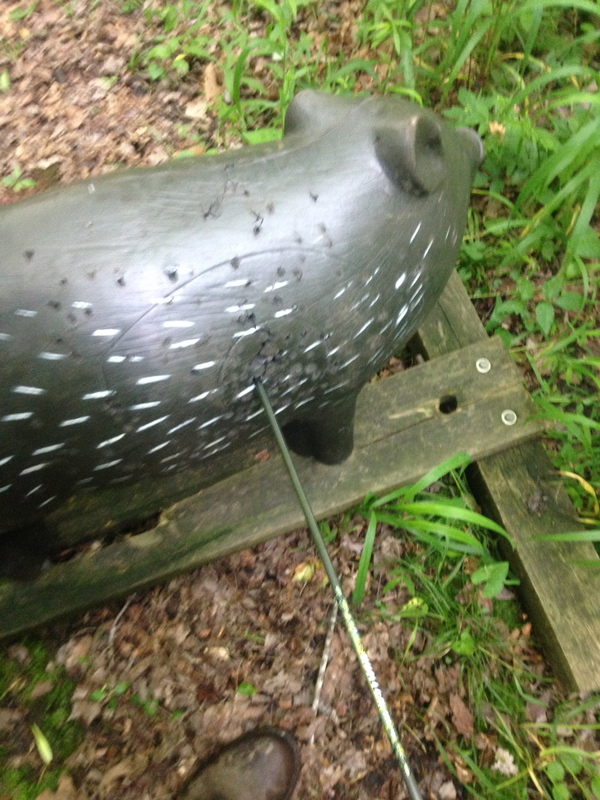 While I was trying to hit the target with an arrow, I thought of Coach Gernay and continued to practice. 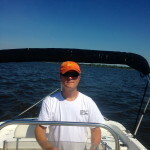 Wind is a fact of life for those of us that live on the water. 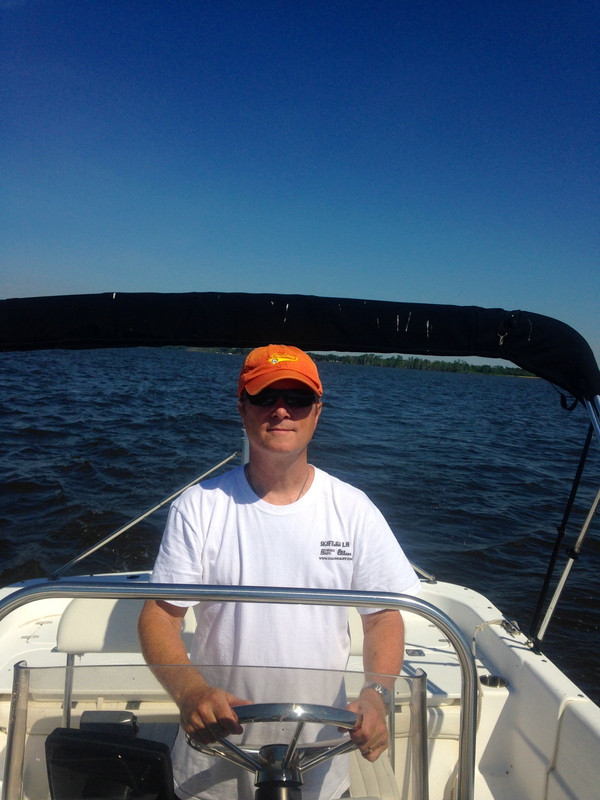 There are times the wind is dead calm, mostly when I go sailing. 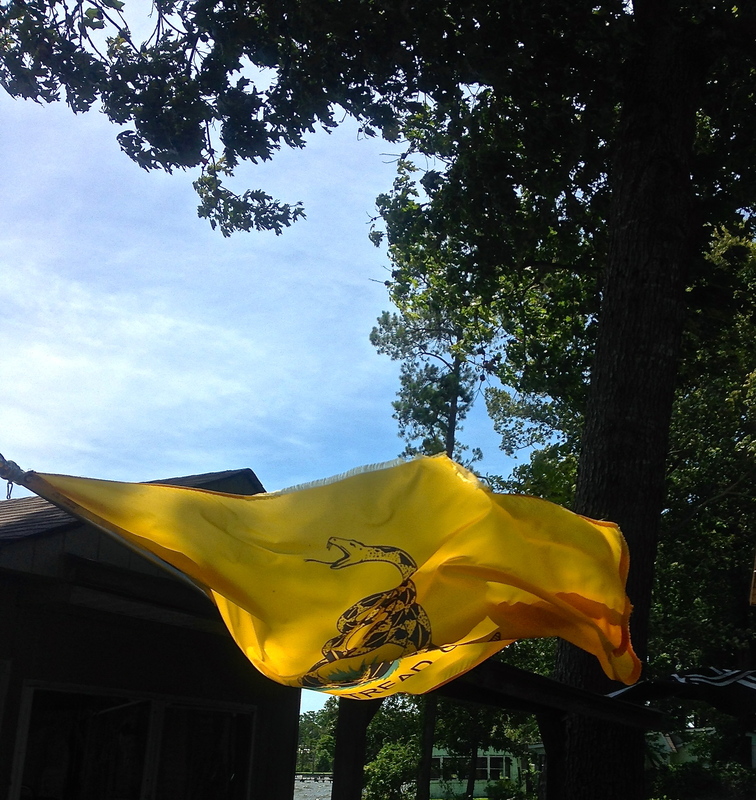 Perhaps, practice and training in the wind will pay dividends in the future. But, if I have my choice, I am okay without it. Shooting 3D following a hard bicycle ride is not bright. I’ve learned that the hard way. Sunday is the most frequent day that I shoot 3D competitions and Saturday is my hardest cycling training day. 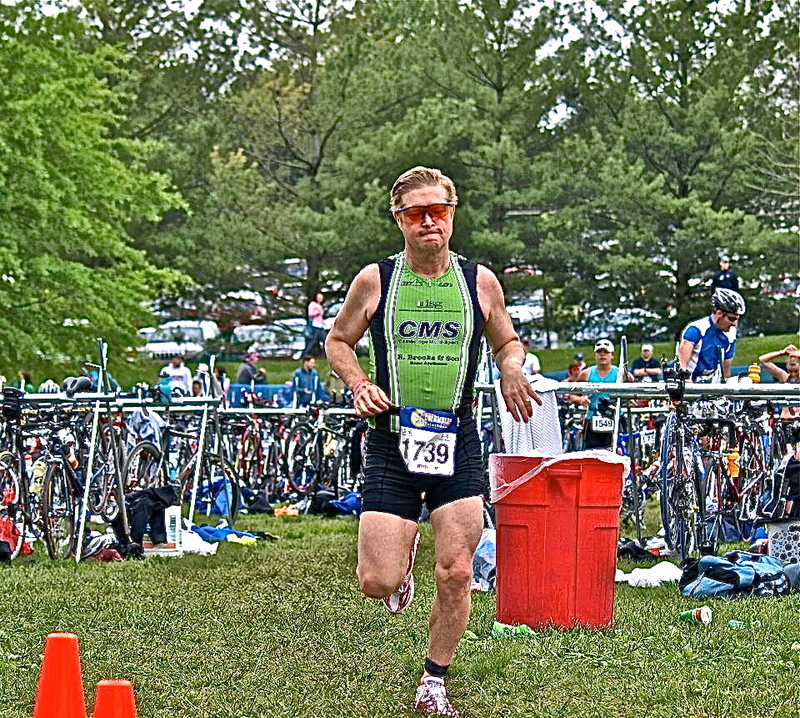 So, when I have a 3D tournament on Sunday, I taper a bit when cycling on Saturday. This arrangement doesn’t always work out. On a hilly 3D course fresh legs are better than sore bike-trodden legs. As it was, the day before shooting on a particularly hilly course I’d ridden hard. My cycling plan was to hold back on Saturday, the day before the tournament. 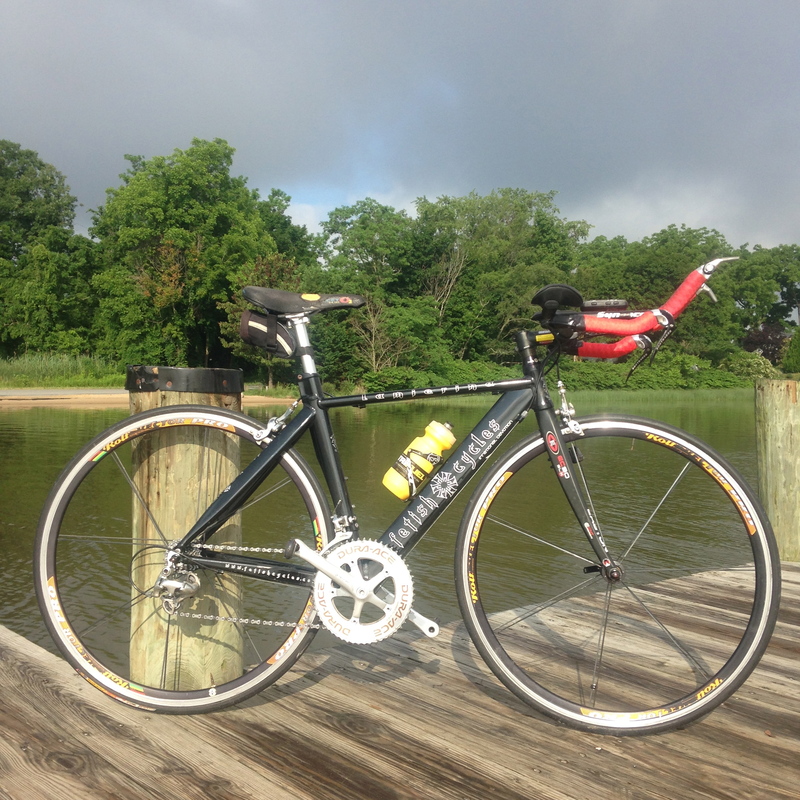 I’d ride the distance on my schedule, 52 miles, but do them at an easy pace. 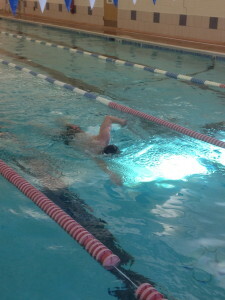 In addition, I was training with a group that typically goes easy on Saturday. I had a plan. 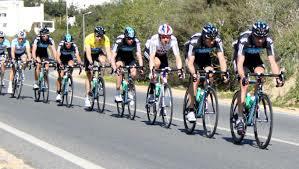 Riding with a group of competitive cyclists, there is always the potential some ‘hot dog’ is going to try being ‘Lance’, ride hard and drop the other riders. There is always one – on that Saturday the guy was me. 56 X 11 with a tailwind, cyclists understand. It couldn’t be helped. 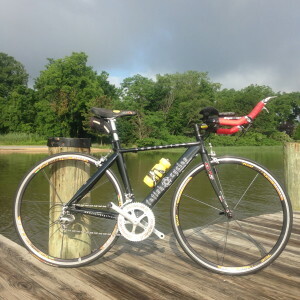 I was on a bike built for triathlons, very aerodynamic, with a huge gear, there was a tailwind and all the other cyclists had road bikes (not so aerodynamic) with smaller big gear ratios. It was perfectly too tempting. Someone picked up the pace a little; my adrenal glands took over causing my brain to shut down. I slammed my bike into its biggest gear, tucked myself into a tight aero position, and within seconds was escaping at 32 mph. It felt great, the other cyclists were dropped, it was a really stupid move on my part, but selfishly it felt great. The group of cyclists was dropped. The riders were a speck in the distance behind me. Then, that tailwind became a headwind. Working together the group of cyclists caught me. I know better, I knew there would be a headwind, but for a several miles it felt great. 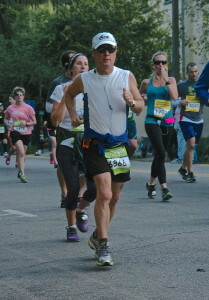 Naturally, from the point where they caught me no one let up on the pace. It was misery, it was payback. On Sunday my legs felt like rubber. 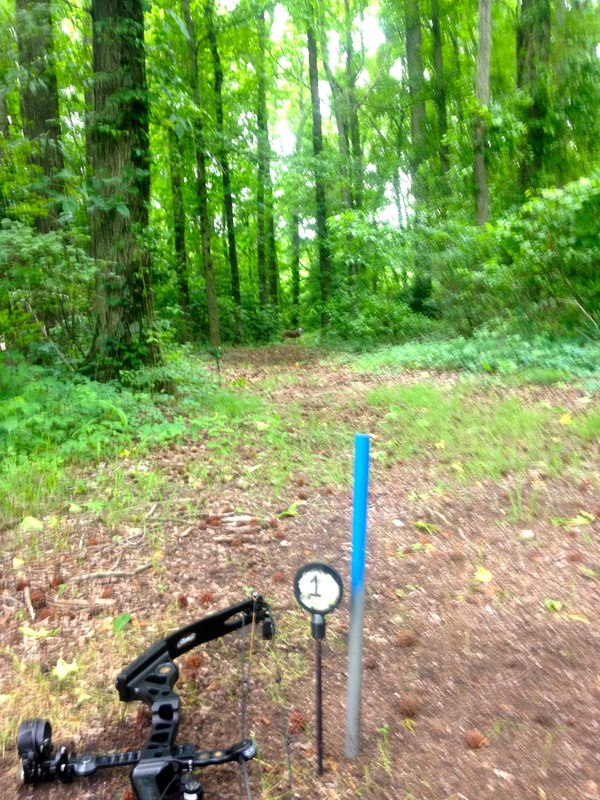 Hiking around the hilly 3D course was pretty bad. I don’t have one of those nice little stools people carry on 3D courses so they can sit down. Sitting on the ground was a possibility, however, I’d have to get up and I wasn’t 100% certain that wouldn’t hurt worse than standing. 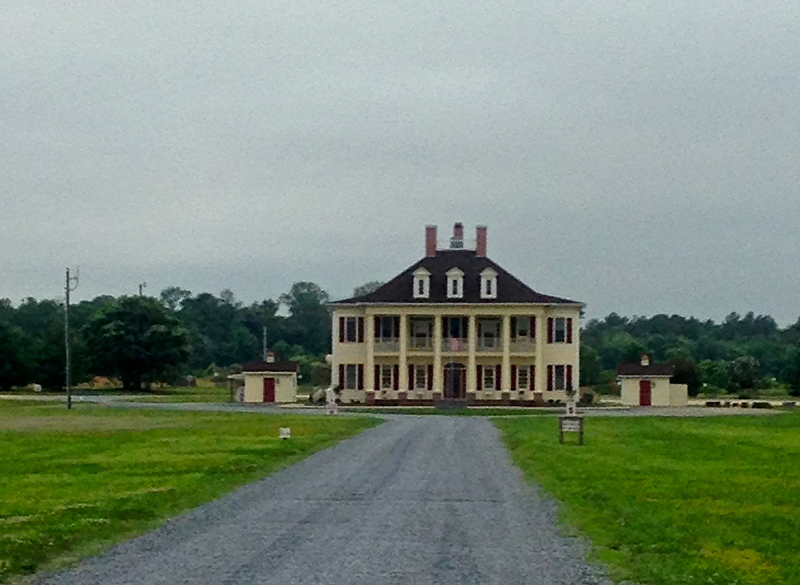 Saturday’s 52 miles weren’t the problem; it was how hard we’d ridden 38 of the 52 miles. If I had taken it easy most likely there would have been someone else who’d have tried to be Lance for a day. Tailwinds are hard to resist. Sometimes, temptation is too great, it felt good to ride hard, but it was stupid and I paid the price. 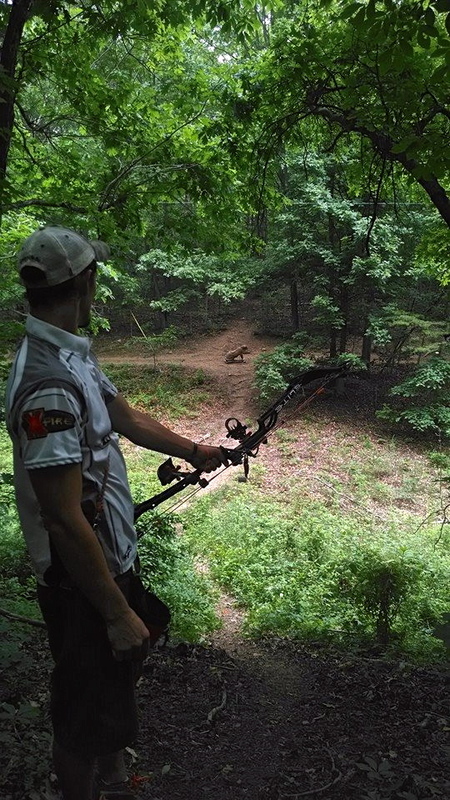 Fishing Creek Archery Club in Battleboro, NC (near Rocky Mount) had an upcoming ASA 3D tournament listed on their website. ASA rules and categories are a little different from IBO 3D shoots. I’d wanted try an ASA competition and was lucky to have found this one. It turned out to be a pleasant experience. 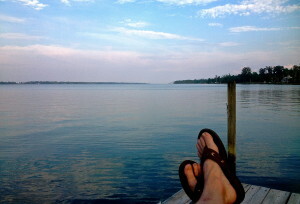 The shoot was less than two hours from my home in Hertford, NC. 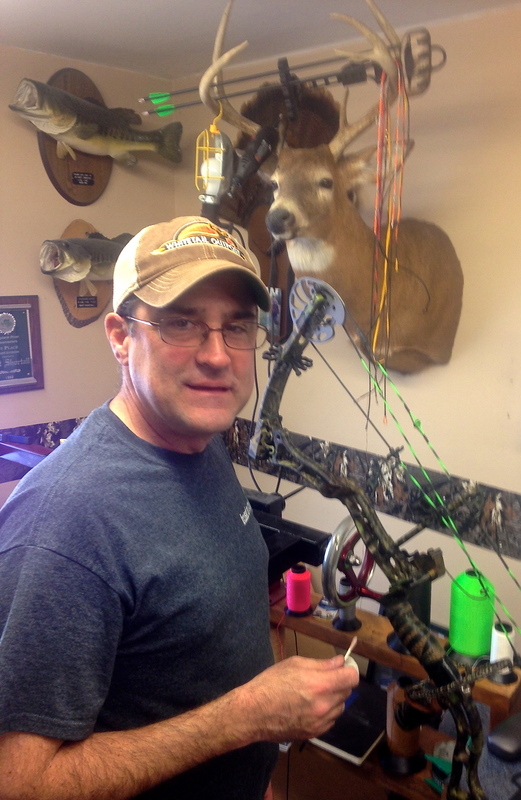 Before heading out I called Mike, one of the contacts listed on the Fishing Creek Archery website. Mike confirmed the event was correctly posted online and would take place. 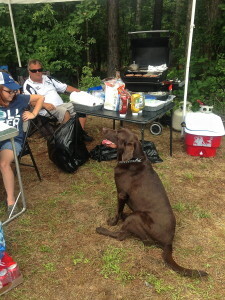 The day of the tournament I arrived early and alone with the exception of my dog, River. River enjoys a road trip and loves watching archery. After signing up for the event, I hung around the registration table and the warm up field until I was grouped with two other archers. 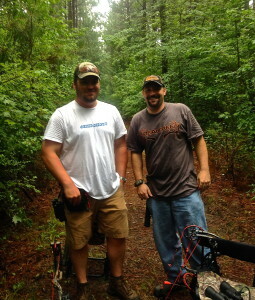 Chris and Brandon signed in solo and were in the bow hunter class. They and I were teamed and after taking a few practice shots up we took to the targets. 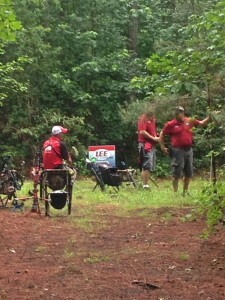 Chris was experienced with many of the competitors and knew to get onto the range sooner rather than later. The three of us were eager to start. 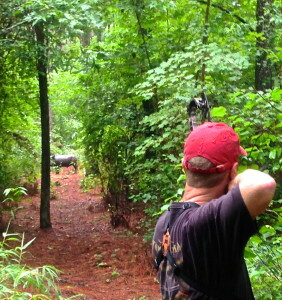 We hoped to get into the woods before many of the pro’s got ahead of us. River would have to wait in the truck. The pros with all their archery apparatus can be slow shooters. Their bows look like something from a science fiction movie. Personally, for 3D, I like keeping it simple. 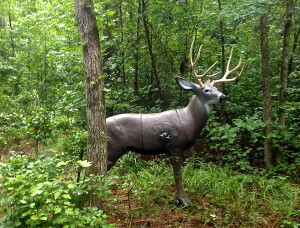 Simple means a Mathews ZXT, an eight-inch Trophy Ridge stabilizer, and a 7-pin Axcel ArmourTech sight. 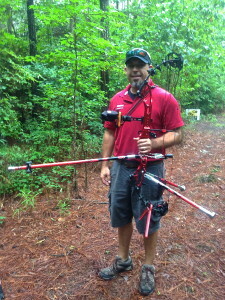 It really is a nice lightweight set-up, great for carrying around in the woods in the summer. The weather was hot, humid, and getting hotter and more humid. The chance of rain was low, but the odds turned in favor of rain. 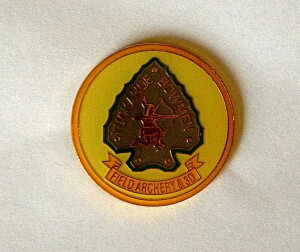 It didn’t rain hard, and it was my first archery competition in the rain. Honestly, I enjoyed it. Chris commented that the soaking he’d gotten from the rain disguised the soaking he given himself with sweat. 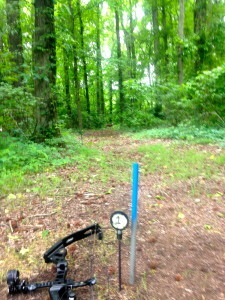 The rain and heat did not distract from the magnificent course laid out for us at Fishing Creek. 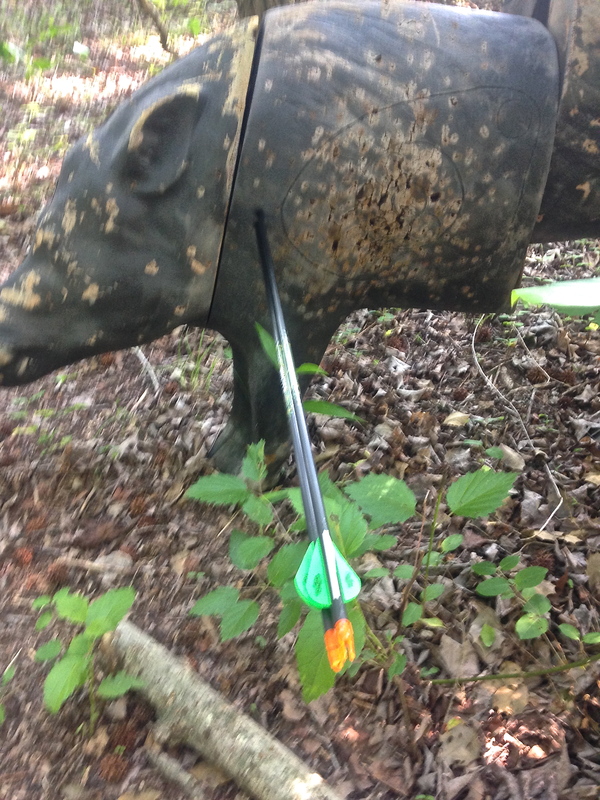 The variety of the 20 McKenzie targets and their placement made it a satisfying challenge. 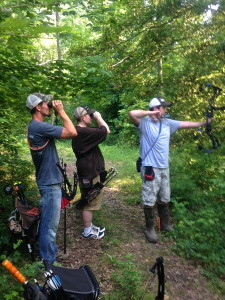 Chris and Brandon are true sportsman and our trio became easy friends. At no point did either of them laugh out loud at my fives. Despite our efforts to get ahead of the professionals on the range we did end up behind a group of four. Two represented PSE and the two where pros in red shirts (as were the PSE shooters) but I have forgotten who they represented. They were actually fast shooters and we rarely waited more than a minute or two for our turn at the stake. When they’d shot their final target and because I’d overheard some grumbling I asked, “Well, are y’all leaving these woods with the same arrows with which you entered?” Three out of the four professionals archers found humor in the question. Afterwards, the staff sold burgers and hotdogs. I was starving and the burger I ate was one of the best ever. 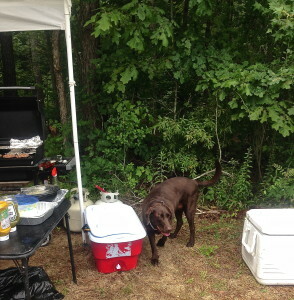 River was now out of the truck and found her way to the concessions. She conned a number of people for their food and came away with a hamburger, half a cheeseburger, and a hot dog. Scores were posted on a large board near the food. I was in the running for a top place. By the day’s end I’d been knocked down to fourth. ASA is just a bit different than IBO. 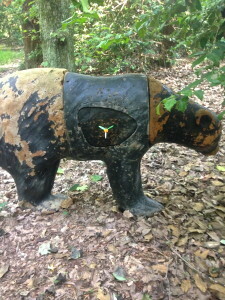 Nevertheless, once the target scoring is understood, the shooting is the same. 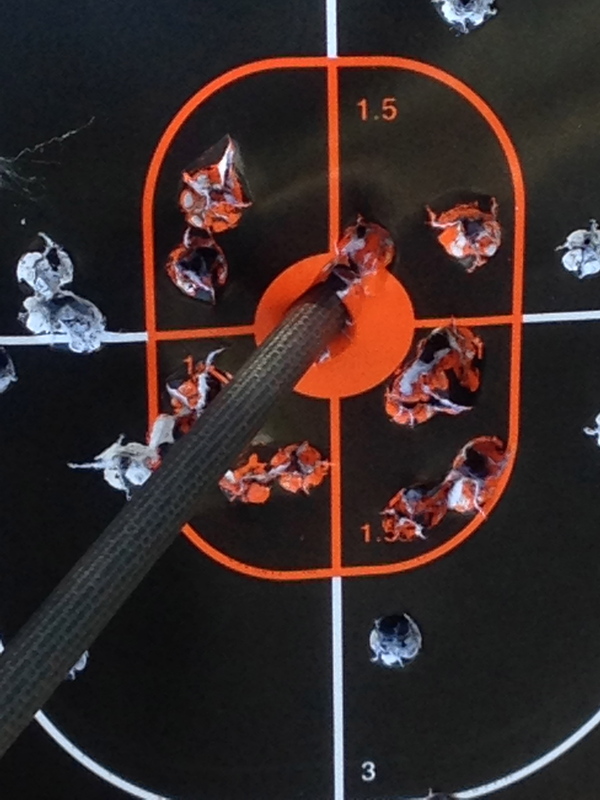 I was a little nervous for the first few shots but got into a zone on the back ten. 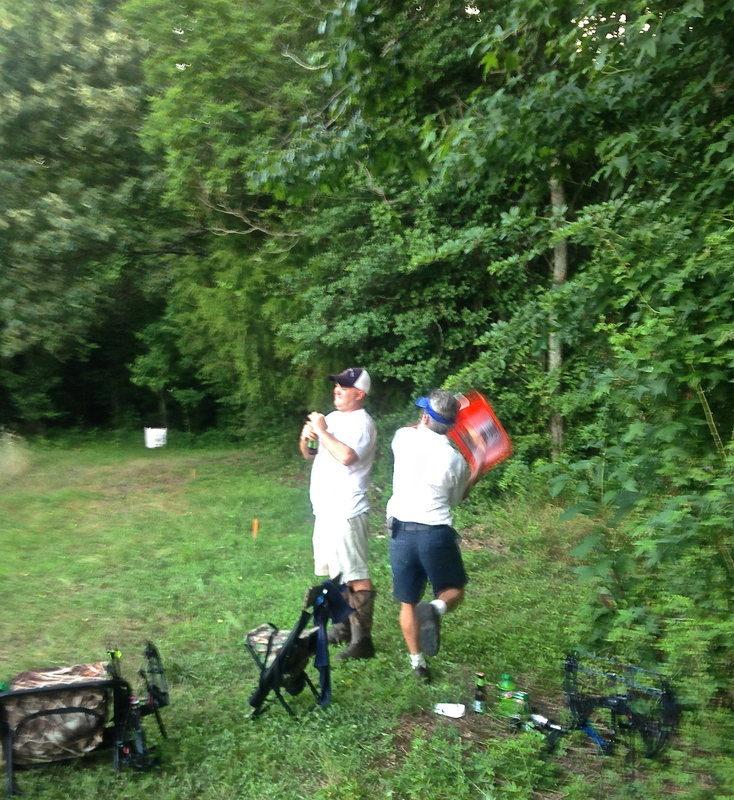 The turn out of shooters at this 3D tournament was among the largest I shot against during outdoor competition. I’m glad I found their website happy I made the drive to Fishing Creek. I met some nice people for my effort. River made new friends and ate well. Hopefully, I can make their next shoot July. The fellas at Cypress Creek Archery figured out how to make their DVD player operate. It was on while I was practicing at their indoor range. The video was of an archer testifying about his athletic abilities, the frequency of his workouts, and how fitness improves his performance as an archer. 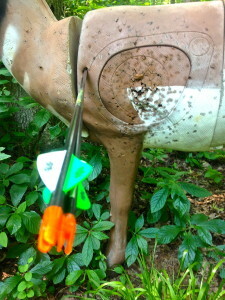 That caught my ear, I think fitness is important and complements archery. I’ve also noticed a lot of archers are a bit out of shape. They are not alone. A recent survey found that 160 million Americans are either obese or overweight. 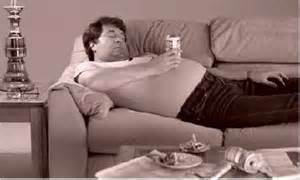 The US has 78 million obese adults, the highest of number of any country in the world. 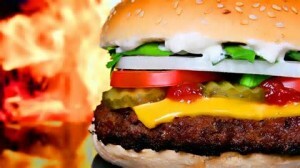 Nearly three-quarters of American men and more than 60 percent of women are obese or overweight. American is not alone; there are six countries with 20% or more of their population being obese. These countries are: Mexico, United Kingdom, Slovakia, Greece, Australia, and New Zealand. The World Health Organization states that by 2015 there will be 2.3 billion overweight people in the world, 700 million being obese. 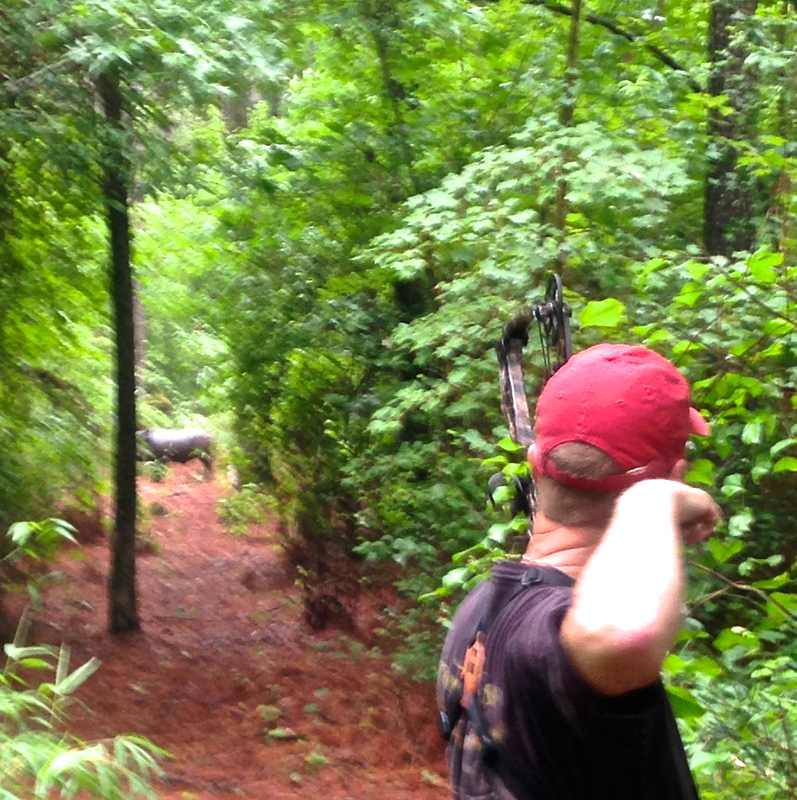 Look around the range next time you’re there – you’ll see a lot of big people shooting bows. If you need to lose weight, think, you did not gain it overnight. Give yourself time to lose it. Set reasonable goals for yourself. Find a diet that works and you can follow. When you start a diet and a fitness program, you may find the weight initially falls off faster than occurs as you near your goal. Be patient and go slowly, that will help you reduce the risk of rebounding. If you want more aerobic fitness, find sports that you enjoy and do them. If you’re having fun you more apt to stick with it. 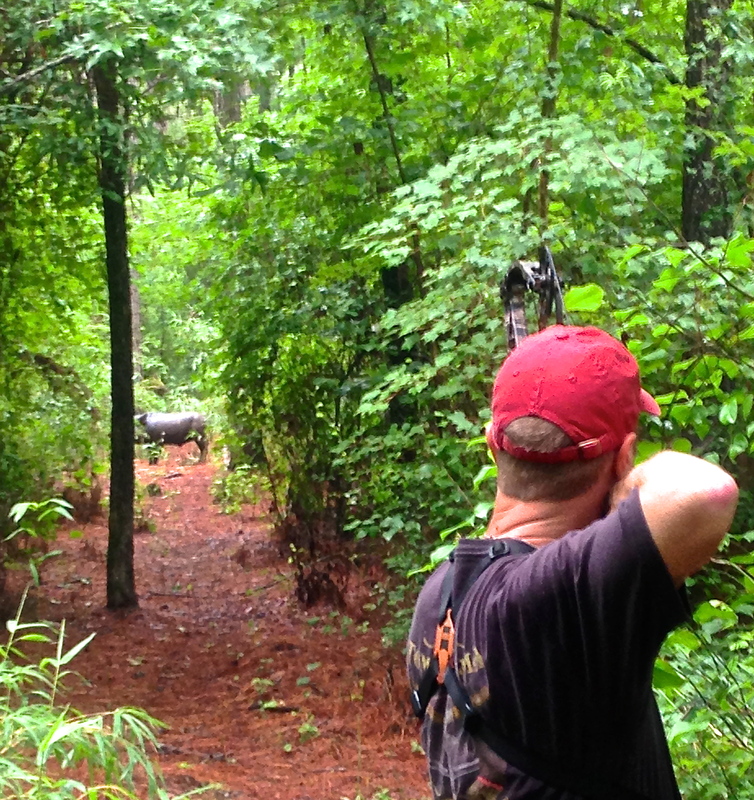 Get your archery friends involved. There is a lot of truth to “the more the merrier.” Check around your club, you may find others that would be interested in running, cycling, or some other aerobic activity. Heck, y’all could get some t-shirts made and collectively support a charity. Being fit is important for more than becoming a better archer. 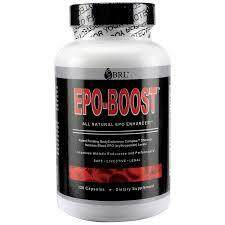 Daily aerobic exercise is a life style than enhances overall well being. Running a 5K or a marathon is exciting and earns you bragging rights. If you are not already up and running or participating in another sport, give it some consideration. You may find that it becomes a life style and improves your fitness as an archer. 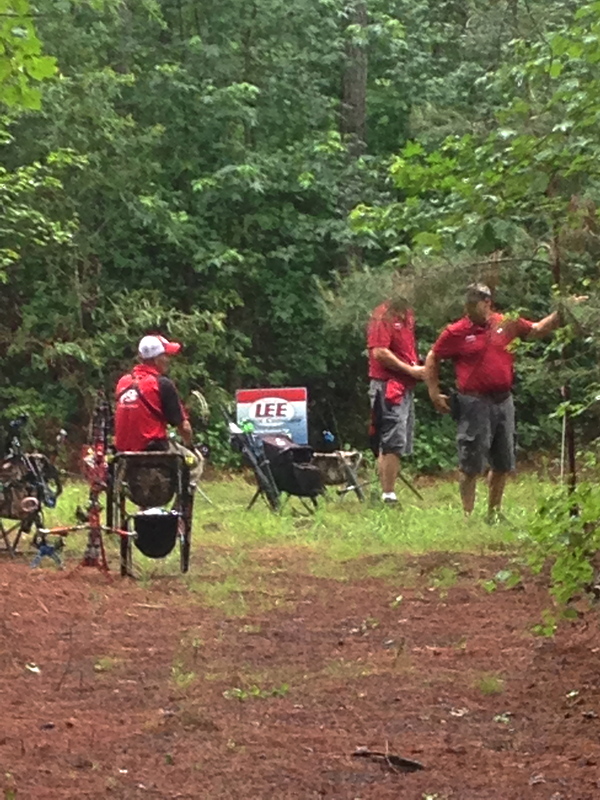 The Team Trailer Park has been shooting at Norman’s “Soggy Bottom” 3D range for years. 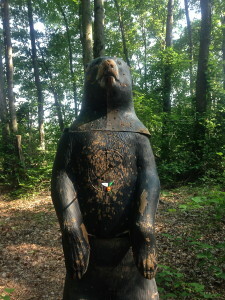 It has been the weekly training course for top amateurs and at least one professional archer. Norman and his family are moving to Nashville and the last night at Soggy Bottom had arrived. The usual suspects turned out for the range’s swan song. Norman had reduced the targets from the standard 20 to 15. The fifteen that remained weren’t foam animals stationed at the end of an open lane. Par for Norman, he’d laid out an exception course. Eight archers took part in Soggy Bottom’s denouement: John, Wes, Bart, Paul, Chris, Lee, of course Norman and finally me. John, Wes, Chris and Norman were about a week out from taking top honors at the Virginia State 3D Championship. Paul had just returned from vacation, bringing with him a cold. 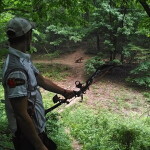 Lee has placed in the top 3 in the Maryland 3D Championship and Chris has great form doing well even when he liberates his release during a shot to send it and the arrow sailing. Paul is a multiple IBO World Championship shooter and one of the best hunters in the area. Bart, a former-professional, has recently begun shooting following shoulder surgery and carried a bow rigged to reduce the pull weight for this final contest. Norman, a 4-time IBO World Championship veteran, rarely fails to finish among the top places in a tournament and is master of Soggy Bottom. Nerds or Just Plain Creepy? Norman divided the eight of us into two teams, The Dutchmen and the other ‘Group.’ The Dutchmen consisted of Chris, John, Wes and me. The other ‘group’ held Norman, Paul, Bart and Lee. Entering the course, the teams moved amid the targets like Ninja archery masters. Well, very loud Ninja’s or to be more accurate like drunken sailors on a weekend pass. Norman yelled scores, naturally all 11’s, for his team. To prove his announcements, at stake 7 he produced his team’s scorecard to reveal, in fact, all 11’s. His ruse de guerre failed when John, of the Dutchmen, noticed the ‘Group’ had fifteen 11’s and they’d only completed 6 targets. Throughout the contest, the Dutchmen confined themselves to the upmost standards of archery ethics. The ‘Group’ became more desperate for victory as the Dutchmen expanded their ever-increasing lead. When Chris noticed his sweat towel (it was 97 degrees in the swamp) missing he asked if anyone had noticed it, no one claimed knowledge of its whereabouts. As Chris was preparing a shot, the ‘Group’ broadcasted discovery of a missing towel and how best to use it to clear perspiration from the medial area of Lee’s gluteus maximus. The towel use explanation was visibly graphic. This ploy, too, failed, as Chris was wise to let down, laugh, and then shoot another eleven. When the shooting concluded Team Dutchmen had taken victory by a single point. Of Team Dutchmen John and Wes earned the top two individual spots, respectively. 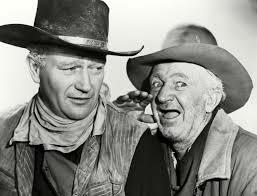 Following the score tally and accolades these long-time friends remained together. No one wanted to leave. 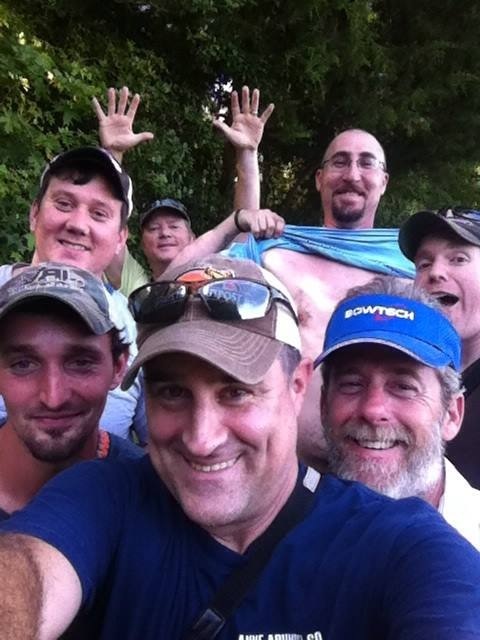 Years of experience shooting and fellowship exist among them. It was clear they’d miss Norman. Soggy Bottom will be missed, but even if it were to remain available, it wouldn’t be the same. It is not the place that makes a group a family. 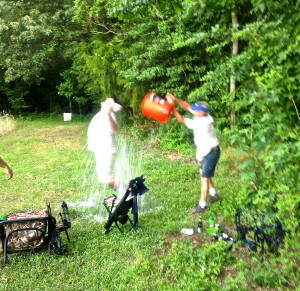 Paul (with the bucket) giving Norman a friendly send off. There are days, in all sports, when athletes just don’t want to train. The hope is that that day coincides with a rest day – a rare event. For me, Monday was one of those days. Practice wasn’t bad once I got started and when I was off I was consistent. 3D was on my schedule for practice. Training included focus on form and judging yardage. People that coach me, those who are paid and those offering free advice (the vast majority), emphasize the importance of form. So, Monday was primarily form and secondarily judging distance. In archery I start with feet first and work up. Hence, a caudalocephalo method of creating a repeatable form. 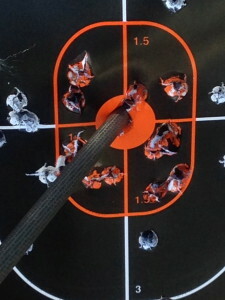 The technique provides me easy to remember groupings of moves: Feet, core, shoulders, draw, anchor, aim, and release. Mental dumping (trying to reach an alpha wave dominance*) should occur between aim and release. I don’t want to think about brain waves while shooting (which would prohibit achieving alpha waves) so I didn’t write it down – out of sight, out of mind. My seven steps are easy to recall so I am giving it a try. I had good shots today, particularly on bears. 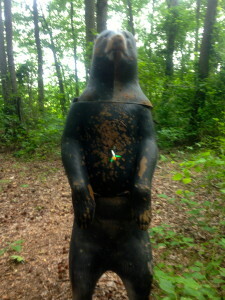 On some targets I shot the same bad shot twice. Several times I smacked a five. When I do that, I repeat the shot. More than once I hit that five at the same point. Optimistically, I thought, well that was consistent, so why did that happen? Shooting 3D is a challenge for me. Monday’s practice was a bit more of a challenge than others since I was off physically and mentally. It wasn’t a rest day and my physical fatigue wasn’t from archery; it was from cycling. 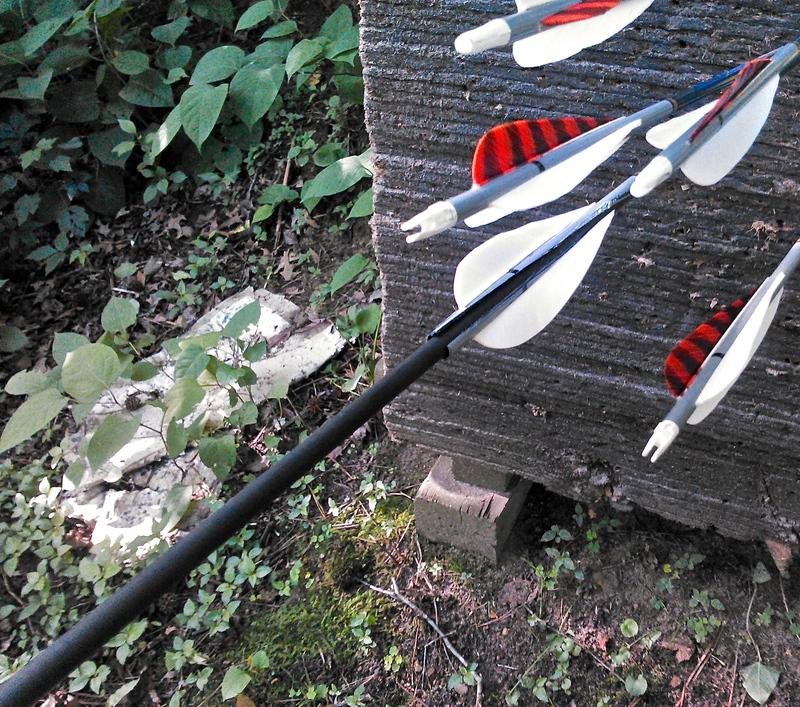 A bright spot following practice, I left the range with the same four arrows I carried onto the course. *Check out archery research for brain wave activity information. 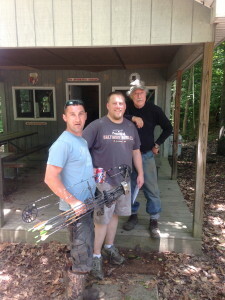 The Tuckahoe Bowmen’s Fathers’ Day 3D shoot fell on Fathers’ Day. As such, there weren’t expectations for a large turn out of archers. We guessed most dads and their families would be elsewhere celebrating, but some might use the 3D opportunity to bring their sons and daughters out for a day on the range. Bill and Mevko, members of the Tuckahoe Bowmen, came early to set up the 3D course. They prepared 30 challenging arrays of targets. By the time I arrived the course was complete. Getting to the range early is a bit of a haul for me and requires a 5:00 A.M wake up alarm to make it there by 7:00 A.M. Honestly, that is a long shot for me. In fact, it was a long shot for Mevko on this particular Sunday. Mevko had been out late on Saturday night. Some Saturday nights are hard to end. 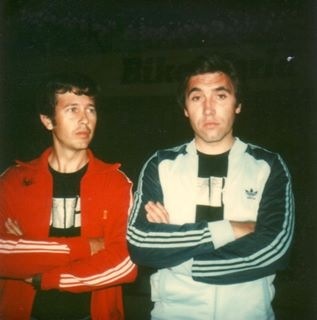 As Mevko explained it, “My alarm went off, I hit it and went back to sleep for another hour.” We’ve all been there. Nevertheless, our Bosnian buddy was able to pull himself into action and still made it to Tuckahoe in time to help set up the course. Bill and Mevko had the range ready by 8:00 A.M. They had help from another archer I don’t know. He couldn’t shoot because of an injury. But, he came, helped set up and then left. That is a good man. We were surprised at how many archers showed up for the Father’s Day Shoot. It was nice to see all the kids that came, as well. These children were extremely excited. Their eyes were big, their bows were little and the pride for their dads unlimited. It was, also, really entertaining to hear these cubs share the stories of their 10 and X shots. During the child’s recitation of their good shots, the pride now shown on the faces of their dads. Archers continued to show up until 11:40 A.M. 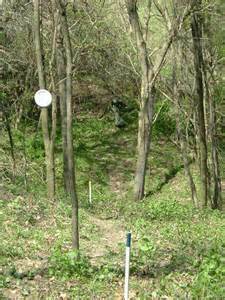 They were greeted by a recently mowed, well laid out course, of which Bill had cleared the weeds from trails the day before. The warm-up range’s field was also freshly mowed offering members and guests golf course like greens to practice on before moving onto the course. 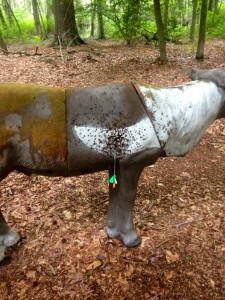 After the shoot I assisted with collecting the targets. The deer and smaller foam animals aren’t too difficult. Bill often handles two of these at a time. 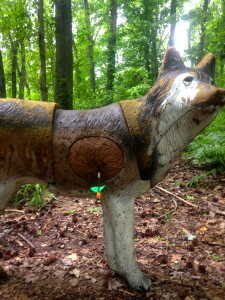 I stick with one target at a time. Once, Bill called for help. He wanted me to put deer on his left shoulder; a pig was already riding on his right. While wrestling a foam elk, and losing, I was rescued by Mevko. 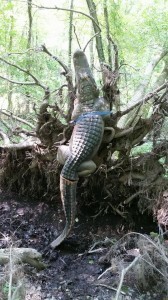 He tossed this giant up like it was a circus-prize animal and pretty much skipped up an embankment. While certain I could out run, out swim, or out bicycle any of the folks I shoot with, Mevko and Bill made it obvious I have got to get to the gym more often. Father’s Day was a success for the dads and children that showed up to enjoy the outdoors and archery at Tuckahoe. All the children left the range with an archery patch. 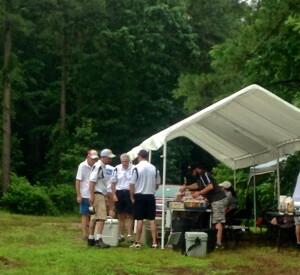 Several of the most frequent archers stayed away celebrating with their families and we missed them. On the other hand the many new archers that shot with their kids was gratifying compensation. My wife, Brenda, decided we needed to do the Dr. Oz cleanse diet. She’s a yoga instructor and into all sorts of mystical methods for health improvement. I accepted the challenge and figured under gastronomically adverse conditions I could sneak by Hardies when I went out to practice shooting and eat a whole food burger. On the first day of Dr. Oz’s program, zealot disciples eat smoothies. In my opinion, one drinks a smoothie and eats food with a fork, spoon, or even chopsticks. The smoothie recipe called for blending in kale with fruit, yogurt and protein powder, which sounded disgusting. 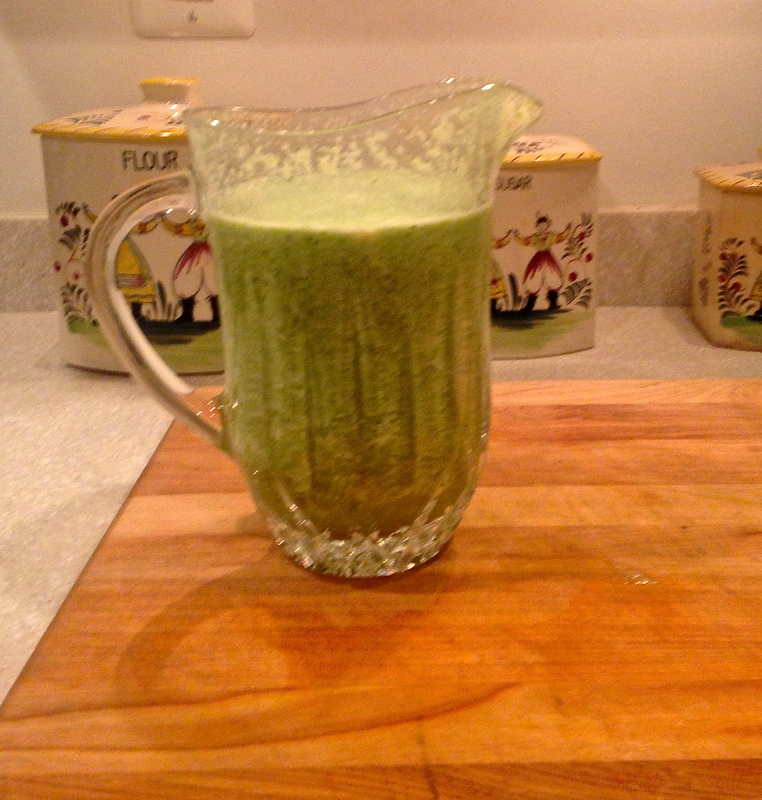 Nevertheless, I followed my wife’s instruction and throughout the day blended kale smoothies. In my home I am master of the blender, a carry over from less healthy libations. The kale in my smoothie wasn’t as disgusting as I’d imagination. Neither, was the kale an improvement to the smoothie’s flavor. Typically, I run in the mornings. A non-kale smoothie is often a delicious drink following a run and consumed along with fork driven food. Post today’s 5K, my smoothie rehydrated me a tad, provided a few calories, and left me wanting chewable food by 8:00 A.M.
For lunch we had another smoothie. Actually, I had all the ingredients gathered near the blender by 10:50 A.M. There was a consensus we should eat (drink) our meal at 11:00 A.M. I suggested we ration the liquid meal by consuming half at 11:00 A.M. and finish it at 2:00 P.M. At this point kale meant more calories and I wanted my full portion. And, if we rationed the drink we’d not be crossed-eyed with hunger before our dinnertime kale enriched smoothie. Such was my optimism. My schedule for the day included 3D practice at Schrader’s Outdoors in Henderson, Maryland around 3:00 pm, one of the primary reasons to ration the smoothie. I was there on schedule, my hunger so intense that not stopping at Hardies along the way was an act of the purest discipline. 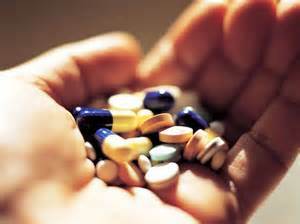 Brenda advised me that Dr. Oz recommends drinking water to help with the hungry pain. 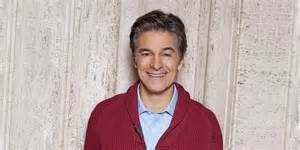 Dr. Oz, apparently, has a sense of humor. 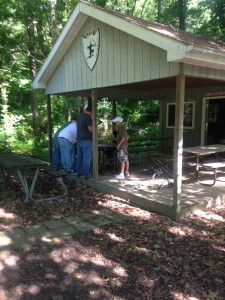 At Schrader’s Club House, where shooters check in, I paid my fee for the 3D course then headed into the woods. At target 1, I headed back to the Club House to get my release, scorecard and pencil where I’d forgotten them. Prior to the first trip into the woods my concentration had been broken when I noticed someone’s left over lunch behind the counter. Back at stake one I had my doubts whether I could finish the course before I passed out. It was worrisome considering that should I lose consciousness I might not be discovered for awhile – meaning when they found me I’d be even hungrier. Consciousness never abandoned me and to my surprise I shot better than usual. The improved shooting was food for thought. It occurred to me, I was very hungry. The McKenzie foam animals looked like unprepared food. Perhaps, some Neolithic survival gene had surfaced to improve my likihood of killing an animal to eat. Of course, this path of reasoning may have been somewhat hallucinogenic brought on by acute hypoglycemia. I finished practice around 5:00 P.M. There was still one more smoothie to drink before the day was done. Because Brenda was teaching yoga that evening we wouldn’t be drinking that meal until after 8:00 P.M. Whether or not limited starvation improves hitting the X on a foam animal is an experiment I don’t plan to repeat on purpose. From the day’s experience I determined I don’t need kale in a smoothie and kale turns poop green. 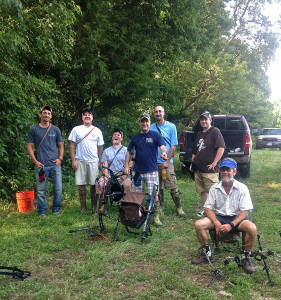 Team Trailer Park (TTP) is the group of archer’s that practice at the exclusive Soggy Bottom 3D range at Norman’s house in Goldsboro, MD. Several weeks ago, Bart Shortall sent a message to the TTP apprising them that the Virginia IBO State 3D Championship was scheduled for June 7th and 8th. Members of the TTP were certain to take the bait, the awards for top finishes included shiny belt buckles. 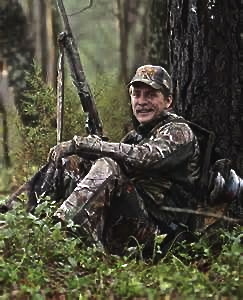 It should be noted that Jeff Foxworthy, from Hapeville, GA, a graduate of Georgia Tech and Southern philosopher has pointed out that rednecks are attracted to shiny objects. Hence, the mesmerizing belt buckle bait attracting the TTP. Bart’s notification of the Virginia tournament reached me, as well. I was eager to test myself against the folks in Virginia. Naturally, I totally forgot about the tournament until Chris Watkins reminded me about it at 10:00 PM the night before the contest. From my home on the coast of North Carolina, I did a quick MapQuest search and realized this shoot was out of my travel reasonability. TTP was, however, well represented. The archers among the select team included: Chris Watkins, Norman Gustafson, John Sapp, Jr., and Wes Pritchett. They decided to get up early then travel over 200-miles to the tournament. The travel distance was about the same for me, but I decided I’d sleep and compete another day. Missing the tournament, I can only report results and rumor. Not surprisingly, TTP did well. All four members of the team placed in the top ten of the Men’s Hunter Class. John won the event and got his belt buckle. Thus, all was right in the universe. John seems to have an abnormal lust for shiny prizes. 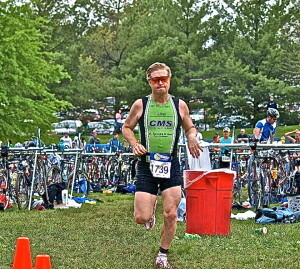 Wes took third place, Chris was 7th and Norman was 10th. Chris had some difficulty during the event. 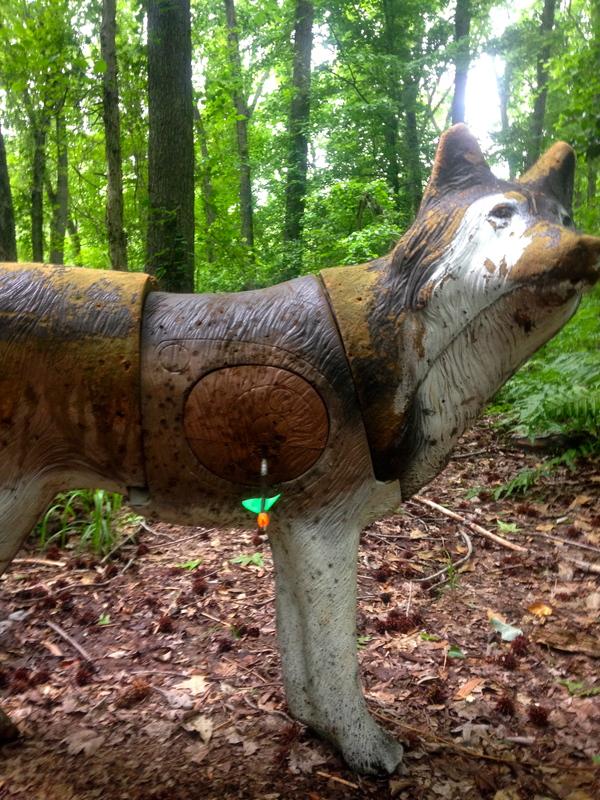 On one shot, as he was aiming, his release slipped from his hand and smacked his bow. He was lucky to have not gotten hurt. Later, Bart disclosed that Chris should have wiped his hands better before aiming. Rumor has it Chris has been eating chicken wings before that particular shot. Personally, I doubt the rumor, but chicken wings are hard to resist and as I mentioned I was not there. Bart Shortall, still reduced to a spectator because of his recent shoulder injury, made the trip with his daughter, Megan. She won her division and brought home a belt buckle. Bart has since polished it to a mirror finish. The Soggy Bottom TTP worked a 14-hour day to attend the Virginia competition. 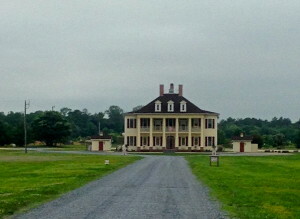 Of the men that shot, they earned 40% of the top ten places including first. Bart’s daughter, a bit too refined to be grouped with the Soggy Bottom boys, took away another of the top prizes from Virginia. Not a bad showing for the folks from the Eastern Shore of Maryland.